What It Is: Bulgur is not actually a plant: You won’t ever see bulgur growing in the fields. It’s actually a Middle Eastern way of preparing wheat that maintains almost all the bran and germ of the wheat kernel, which is why it’s considered a whole grain. “To make bulgur, whole-wheat kernels are steamed, then dried and cracked, and the resulting pieces sorted by size from coarse to fine. Because it’s largely pre-cooked, bulgur can be on the table in as little as 10 minutes,” say Cynthia Harriman, director of Food and #Nutrition Strategies for The Whole #Grains Council. Texture: Pleasant. Soft without being at all mushy. Tastes Like: Bulgur has a mild, nutty flavor that some say is halfway between white rice and brown rice. It’s a great “starter grain” for people just branching out beyond refined grains. Nutritional Information: (1 cup cooked) 151 calories, 0.44g fat, 33.82g carbs, 8.2g dietary fiber, 5.61g protein. Nutrients: (Daily values are based on 1 cup cooked) Higher than average in niacin (1.82mg, 9 percent DV, heart #health), and fiber (8.2g, 33 percent), magnesium (58mg, 15 percent), iron (1.75mg, 9.7 percent, forms hemoglobin in blood), copper (1.37mg, 6.8 percent), zinc (1.04mg, 6.9 percent, cellular metabolism, immune response). 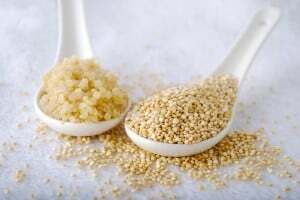 Some of the other nutrients found in bulgur are calcium, vitamin B6, thiamin, pantothenic acid, potassium, selenium and folate. Health Perks: The amount of fiber is off the charts – a whopping 33 percent of the daily value, making it an excellent source. 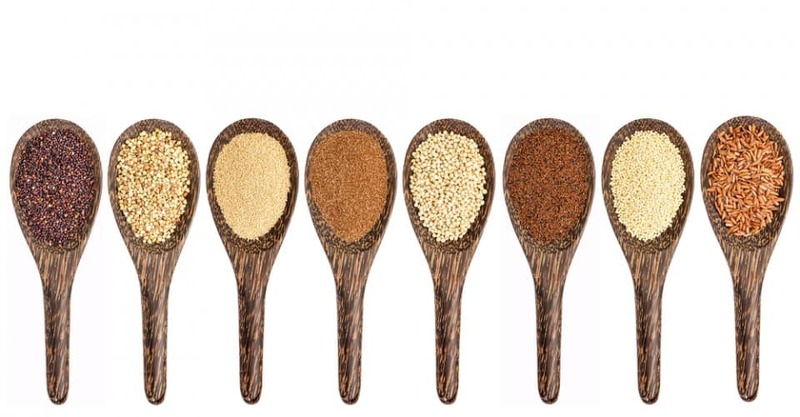 In fact, bulgur has more fiber than quinoa, oats, millet, brown rice and many other whole grains. There are also 98 micrograms of lutein, plus zeaxanthin, which is important for eye health. Best Served or Cooked With: There are three grades of bulgur. “Fine grains are used in such dishes as kibbe, which is a mixture of bulgur and meat or poultry that’s cooked, baked or made into a casserole. The fine grains do well in dishes with meats because they adhere well to the meat. Medium-size grains are used for various salads and in making tabbouleh. The third size, which is coarser and larger, is best used in pilafs,” says Michael D. Ozner, M.D., medical director of wellness and prevention at Baptist Health South Florida and the author of The Miami Mediterranean #Diet (BenBella Books, 2008). It can be used in recipes very much like rice, and couscous and is often substituted for meat in many vegetarian dishes. In a small saucepan, soak bulgur in water for 30 minutes. Drain bulgur through a sieve and allow it to dry thoroughly. Place bulgur, parsley, scallions, peppers and mint in a large bowl. Stir to mix well. In a separate bowl, whisk together lemon juice and oil. Season bulgur mixture with salt and pepper. Add lemon mixture to bulgur – only enough to make salad moist (not runny) – and toss. Fold in tomatoes and cucumber, then cover and chill. Serve on a bed of greens, with seasoned pita wedges for dipping. This salad goes well with toasted, herb-seasoned whole-wheat pita triangles. Nutritional Information: Approximately 177 calories per serving, 3g protein, 21g total fat, 2g saturated fat, 0g trans fat, 19g carbs, 0g cholesterol, 23mg sodium, 4g fiber. Healthy Recipe Source: Michael D. Ozner, M.D., Medical Director, Wellness & Prevention at Baptist Health South Florida and the author of The Miami Mediterranean Diet (BenBella Books, 2008). What It Is: Sometimes known as milo, the type we eat today is called sweet white sorghum to differentiate it from the red variety fed to livestock. “Sorghum is used in other countries to make beer and is now used here in the U.S. as the basis for several brands of gluten-free beer, but it also makes wonderful baked goods,” says Carol Fenster, Ph.D., author of Gluten-Free Quick & Easy (Avery/Penguin Group, 2007). Sorghum is an ancient grain that originated in Africa and then went to India and the Middle East. “It was brought to the U.S. by slaves. Despite its use in Africa as a staple human food, in the U.S. it was mostly used as animal feed. It grows well in hot climates and does not require a rich soil. It is being promoted as the prefect ‘Earth Day Food’ as it needs fewer environmental needs,” says Julie Miller Jones, Ph.D., a professor of nutrition at College of St. Catherine, St. Paul, Minn.
Hard to find in stores, whole-grain sorghum can be ordered directly from a grower at www.twinvalleymills.com, suggests Fenster. Texture: When cooked, it is very chewy and hearty, much like bulgur. Nutritional Information: (1/4 cup) 163 calories, 1.58g fat, 35.82g carbs, 3g fiber, 5.42g protein. Nutrients: (Daily values are based on 1/4 cup) It’s a good source of fiber (12 percent of daily value) and protein (11 percent DV). It also contains 2.11mg iron (about 12 percent), 138mg phosphorus (14 percent) and 168mg potassium (5 percent). Sorghum has heart-healthy vitamin Bs (thiamin 7.5 percent DV, riboflavin 4 percent and niacin 7 percent). Health Perks: This is a perfect gluten-free whole grain for those with celiac disease (those who are allergic to gluten). “Some varieties are very high in antioxidants. It also contains a waxy compound called a polycosinol, which lowers serum cholesterol,” says Jones. Best Served or Cooked With: The whole grains should be soaked overnight to soften them slightly before cooking in water. Or, cook overnight on low in a slow cooker with 4 parts water to 1 part sorghum kernels, says Jones. Many gluten-free bakers use sorghum flour in place of wheat flour. When cooked, it makes a wonderful substitute for bulgur or wheat berries, says Fenster, and it can be used like couscous for a delicious mix of whole grain, vegetables and meat. It can even be eaten like popcorn. Sorghum produces a robust pilaf with lots of chew and texture. For best results, have all ingredients at room temperature when you start the slow cooker. 1. Lightly coat the liner of a slow cooker with cooking spray. Add all ingredients except the Parmesan cheese to the slow cooker and stir to blend thoroughly. 2. Cover and, without removing the lid, cook on low for 6 to 8 hours or until all liquid is absorbed. Stir in Parmesan cheese and serve. Healthy Recipe Source: Carol Fenster, Ph.D., author of Gluten-Free Quick & Easy (Avery/Penguin Group, 2007).